Bulwark, a quiet town... or is it? Four best friends, Sophia, Scott, Chloe and Chris, are just trying to manage their senior year at Bulwark high school when Sophia realizes that her feelings for Chris are really meant for Scott. Before she can deal with that though, the four frie Bulwark- a wall or stockade that protects or sometimes hides the truth from the outside world. To ask other readers questions about The Darkness, please sign up. Brittney Leigh steps into the literary circle with a book that suggests she has true promise as an author. THE DARKNESS is the eighth volume in the Bulwark Anthology, an impressive collection of authors responding to the paranormal thriller BULWARK by the well-known and respected author Carole Roman. While Brittney’s story is focused on the small town of Bulwark and its inhabitants and dark mysteries, the technique she has elected for her first novel – entries into a Diary by her lead character Sophia – works very well indeed. By relating her story in the ‘confidence’ of her Dear Diary, Sophia is free to relate to the impulses of attraction and the interplay of friends in the search for romance while at the same time drawing the reader into the thriller aspects of the theme of disappearing high school students and the paths that mystery creates. Bulwark, a quiet town... or is it? Four best friends, Sophia, Scott, Chloe and Chris, are just trying to manage their senior year at Bulwark high school when Sophia realizes that her feelings for Chris are really meant for Scott. Before she can deal with that though, the four friends then stumble upon Bulwarks darkest secrets when a spell is cast on Bulwark High. Students have been disappearing and no o Bulwark- a wall or stockade that protects or sometimes hides the truth from the outside world. Bulwark, a quiet town... or is it? Four best friends, Sophia, Scott, Chloe and Chris, are just trying to manage their senior year at Bulwark high school when Sophia realizes that her feelings for Chris are really meant for Scott. Before she can deal with that though, the four friends then stumble upon Bulwarks darkest secrets when a spell is cast on Bulwark High. Students have been disappearing and no one has any clues as to their whereabouts. With a town curfew set and parents on edge, the four friends decide to take things into their own hands. 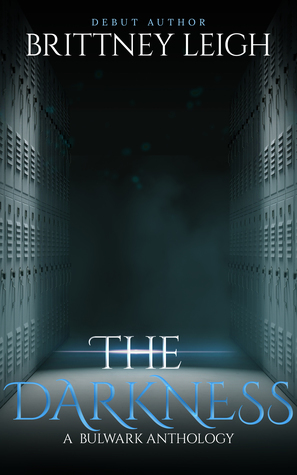 Will they break the spell, or will Bulwark High and the town be changed forever?Based on Bulwark, a paranormal thriller by Brit Lunden, The Darkness is the eighth volume in the multi-author Bulwark Anthology. Dear Diary; oh my how I loved this one. I absolutely love the take on this one. The writing structure of the story is superb and allows it to flow so well. I love how the 4 friends interact and deal with each other. Loved also seeing how Sophia's views on people changed throughout the journal entries. I found the format of this writing so liberating and enjoyable to read. We also have present the constant thread of missing children and how the teenagers decide to find out what is really happening to them. This is a very captivating story. I have loved reading this and the entire series so much and can't recommend highly enough that everyone should give these a read! HIGHLY RECOMMEND READING THIS AND ENTIRE SERIES AS WELL. Oh, I really like the structure of this one. 'Dear Diary', indeed :P The format is liberating, as allows the narrator to avoid trying to be anything but who she really is, all her feelings unfiltered and out on the open. I really enjoyed the way the four friends interact, and how Sophie's rose-tinted vision of Chris changes as we advance into the story. And the constant thread of missing children is also present here, and the teenagers are decided to find what's really going on. A very enthralling Oh, I really like the structure of this one. 'Dear Diary', indeed :P The format is liberating, as allows the narrator to avoid trying to be anything but who she really is, all her feelings unfiltered and out on the open. A refreshing read. The style reminds me of a Goosebumps book with more teenage situations in it.